“Time is money”. This is an expression that often widely known and used. This often leads to an unrealistic deadline that is rushed to be met. This can cause some problems when you’re working; one of the biggest one is the fact that many are unaware of proper safety measures. Construction any time of the year always needs to be done with safety in mind for your own life and the lives of those around you on the job site. There is nothing more important than safety. This must be ingrained in the minds of everyone on the project; that nothing is more important than safety. Fall protection is incredibly important seeing that falls account for 40% of deaths on a construction project. Therefore, it is highly important that you make sure that you know exactly what the safety procedures are from OSHA be it that you’re using scaffolding, scissor lift, or boom lift. Every worker should be properly trained on each piece of equipment knowing what the exact procedures are when it comes to fall protection; such as are there a need for guard rails? Are you working on a roof? Are you properly tied off? There are going to be many different scenarios in which a fall can potentially occur. One way to avoid them is before starting a project, look for what the potential fall hazards are. 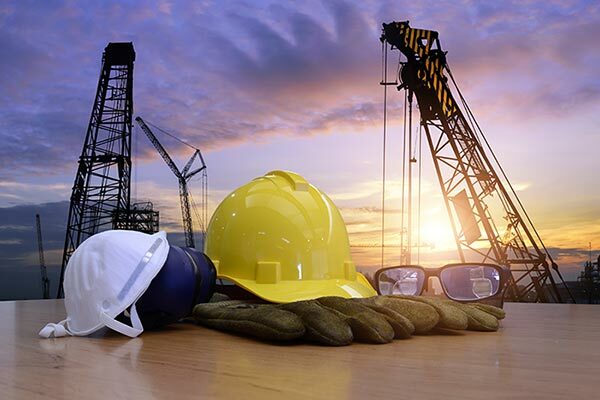 Once establishing those it is then essential to make sure that all precautions are taken following the guidelines that OSHA has put out for the lives of everyone involved. The installation of fall protection is the responsibility of the employer to be up and ready to go before work ever occurs. PPE (personal protective equipment) is an important part of being safe when on a construction project. Some common PPE is hardhat, safety vest, safety glasses, gloves, and when it calls for it a mask and ear protection. A safety vest allows for those operating heavy equipment the ability to see you more readily. Additionally, because people are often working above other hardhats prevent serious head injuries from falling tools and other items. Eye protection can save your eyes from chemicals splashing in them or debris from getting inside them. Gloves likewise protect our hands from the work being done. This of course everyone’s responsibility. Training can go a long way to the safety of everyone on the construction site. Continual proper training and reminders can reduce the amount of lives lost on a construction project. Yes, this takes times to do but in the end a human life is always more important than a building. Training on fall hazards is important for each worker to be trained in all aspects such as harnesses, pot holes, machinery, and high work places such as roofs. Having the lack of knowledge or not enforcing the guidelines falls mainly on the company but not speaking up makes the worker accountable for his own life as well. ProStar Rental is your leading equipment rental in such central locations of Texas. We believe that all work should be done with all safety measures in place. Everyone’s safety falls on themselves and those around them. It is a group effort when on a construction project. All equipment is cleaned, inspected, and tuned after each use. This ensures that you are getting a piece of equipment that is in safe working condition. We also provide you with safety instructions for each piece of equipment. Call us today if you’re in need of rental equipment!